Your wedding ring represents continuity and commitment in the form of a constant and unbroken band. 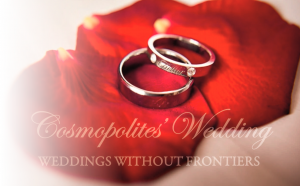 Cosmopolites‘ Wedding Agency will be more than happy to help you with your choice of the wedding rings that are made with care to be presented as a symbol of love to last a lifetime. In a close cooperation with international producer of diamonds’ jewelry we are offering you exclusive prices – discounts up to 15 percents for the whole collection. Every wedding ring that is hand finished and inspected in D.I.C.’s own workshops. This takes a little time but we believe it’s essential to ensure the perfect quality of your wedding ring. You can also make your own design of the wedding rings.